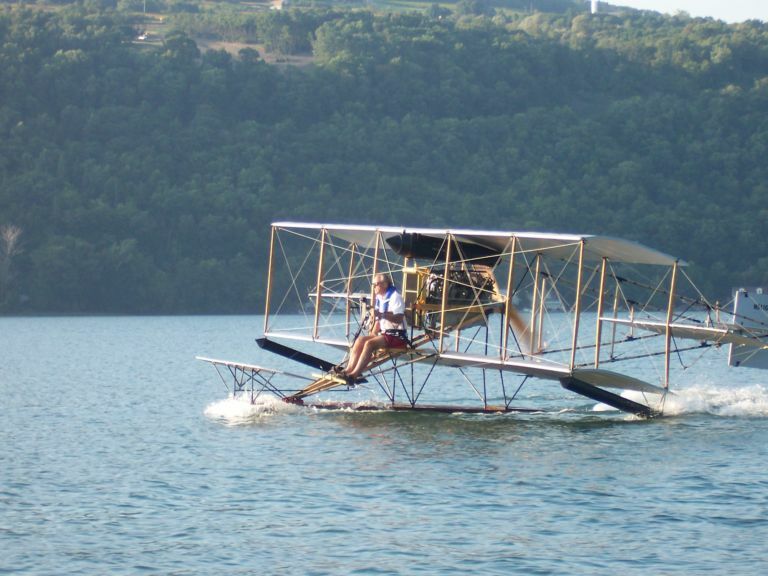 On June 30, 1911, Theodore (Spuds) Ellyson became the first naval aviator when he piloted a floatplane off Keuka Lake near Hammondsport, N.Y. The aircraft was a Curtiss Model-E pusher mounted on center float with balancing wingtip floats. 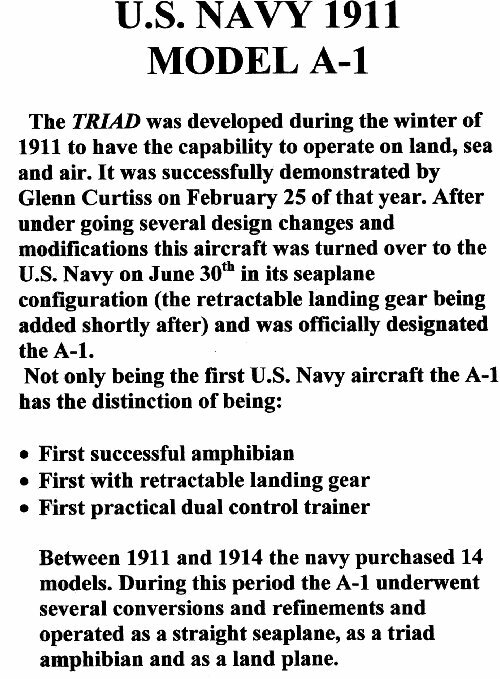 The amphibious craft was named the “Triad” by it’s builder Glenn Curtiss, standing for land, sea and air. However, the Navy designated it the A-1. In all, fourteen type A-1s were built, all with different options available. The Glenn H. Curtiss museum elected to build a reproduction of the A1 model with all the extras. Long range fuel tank, Curtiss OX-5 engine, two seats, a throw over yoke and retractable landing gear. The work was done under the direction of Art Wilder, and his merry band of volunteers. Keeping the aircraft as close to original as possible was the main priority. 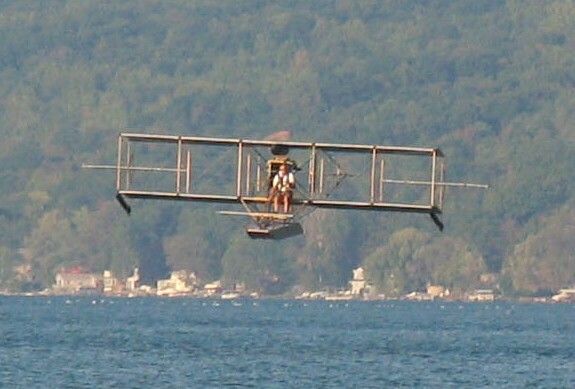 For this reason, the flying and landing wires are adjusted by using the original Curtiss motorcycle spoke turnbuckle system. As bamboo was used in the fuselage of the original A-1, we also used it. 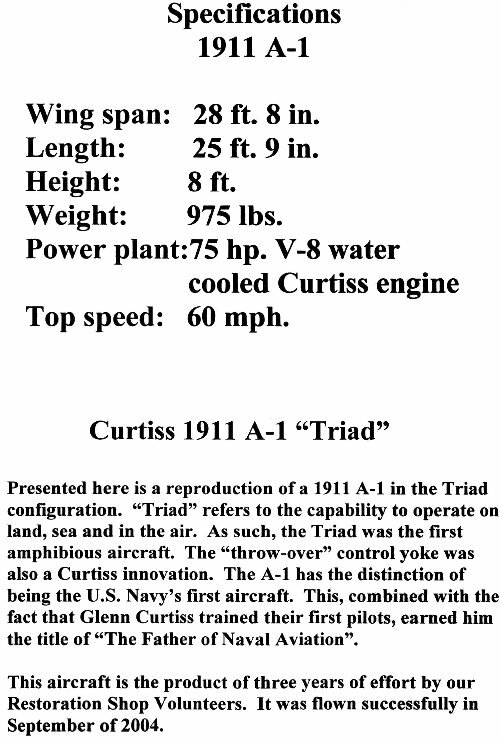 We even purchased from the same company that sold it to Glenn Curtiss. And the shoulder yoke control system was used. (This is where leaning to the left or right operated the ailerons.) Turning the wheel operates the rudder, while pushing and pulling it operate the pitch controls, which are made up of a canard and elevators. It is interesting to note that because the ailerons are mounted between the upper and lower wings, there is no asymmetrical drag associated with aileron use. Sort of set it and forget it in the rudder department. 1 - How would it handle take off and landing without a stepped hull? 2 - Where to set the stabilizer trim and the canard? (I wanted plenty of nose down authority.) Since it was adjustable, we set it as it was set in many of the old pictures of the A-1 (This turned out to be just right). 3 - How was I to maintain pitch awareness with virtually nothing in front of me? 4 - How much aileron authority would there be with a shoulder yoke? After overcoming some flotation problems, we felt we were ready to start the trials. An OX-5 engine has to be warmed up before flight to properly vaporize the fuel in the manifold. We devised a system of putting a rope around the two vertical posts just above the float and a little behind the wing. We chose this method in order to decrease the strain on the wing, allow more people to hold on to the rope, and keep them out of the prop blast. When ready, one side would let go and the rope would slide free without hitting the prop. The day was clear, 80 degrees Fahrenheit, wind 0-5 knots. The surface of Keuka Lake was light ripples. While warming up, I check the pitch authority which responded well. Static RPM was 1360. 90 HP was achieved at 1400 (redline 1450). With the engine warm, the signal given, one end of the line was released and I began to taxi. Rudder authority was increased as power was added. I turned and added full power to step taxi downwind to the take off point. As soon as I saw the nose come up and the spray move back, I knew it would fly. While on the step downwind, I again checked flight control authority. All were good. I found that I had much better leverage with the shoulder yoke (ailerons) if I gripped the seat frame with my right hand. I stopped and turned around about a mile down wind. Slowly I added power and set the rudder to keep my heading. As I gained speed, holding slight backpressure, the spray moved back, the nose came up and the aircraft smoothly lifted off the water in a most delightful manner. There was no popping off the water or awkward rotation problems that I had been concerned about. In fact, I wasn’t sure exactly when I left the water. At about fifteen feet I leveled off, noted that the wheel was set just right to give the neutral pitch setting a comfortable flying position. Since I was flying into the end of the lake, I immediately started into the landing phase. The plan was to point the nose down until I was two or three feet above the surface, then back off on the power and let it settle on slightly nose high. This was basically what happened except that with nothing in front of me, I wasn’t real sure of my pitch attitude. The aircraft basically just landed, beautifully. There was no pitch over tendency at all, just a smooth settling. Buoyed by the success of the first flight, I taxied back for another. This time I rotated more abruptly and the aircraft lifted off more positively. Just as I was leveling at about fifteen feet, some wind ballooned the aircraft upward. Despite a few mild attempts to lower the nose, I wound up about fifty or sixty feet. I would push forward, the aircraft would pitch nose down, but all that happened was that the speed would build up. At one point there was a mild dutch roll tendency which was predicted by one of the volunteers, Brian Grigsby, who is an aeronautical engineer. This was due to the center of lift moving ahead of the center of gravity as the speed increased. Now I won’t say that the A-1 is a high drag vehicle, but a pigeon couldn’t fly between the wings due to all the wires. So most flying is done at full throttle. This being the case, a serious reduction of power in flight should be reserved for very special occasions. Well, at fifty feet, speed increasing, and the lake in front of be rapidly decreasing, I decided this was one of those special occasions. So I pushed the nose down and pulled the power. The aircraft glided nicely albeit at somewhat of a steep pitch angle. Some power was added at the flair, the wing dropped slightly and we landed right float first, then the hull. Despite being wing low at touchdown, the landing was still quite smooth. In retrospect, while concentrating on the glide and flair, I resorted to conventional controls by turning the wheel right (right rudder) to pick up the left wing. This caused the loss of lift in the right wing just before touchdown. Safely back on the water, I thought that was enough flying for one day. It was cool and windy. The engine started easily and ran well. Once warm, I taxied out in a crosswind. It took some leaning and wingtip flotation to keep the aircraft level. Once into the wind, I applied full power. Once again, the nose came up, the spray moved back and we were airborne in about three aircraft lengths. There was no tendency to porpoise as the non-stepped float reached across the waves. Level at ten to fifteen feet, I wondered how landing on waves would be. Would it porpoise or slam the nose down? Again, landing was stable and smooth. After settling into displacement, I tried to turn downwind using power. It didn’t work. At idle, however, I noticed that with each wave the nose came around further, so I just let it keep coming until I was headed down wind. I step taxied back to a happy crowd. Over all, the aircraft was a delight to fly. It was light and responsive and basically it wanted to fly. The control system, though quite alien to the conventional control system that I am used to, worked very well. Especially not having to work the rudder with every aileron input. These three short flights were the most memorable I have ever experienced. Given the location and the aircraft, they were a wonderful trip back in time to actually experience an historical moment. I feel I have had the honor of sharing the same thrill in the same place with a great man -- ninety-three years later.